Rava modak recipe – It is quick and easy to make modak recipe. Also known as semolina modak. ganesh chaturthi was yesterday. But Ganpati festival lasts for 10 days. It ends after the ganesh visarjan. 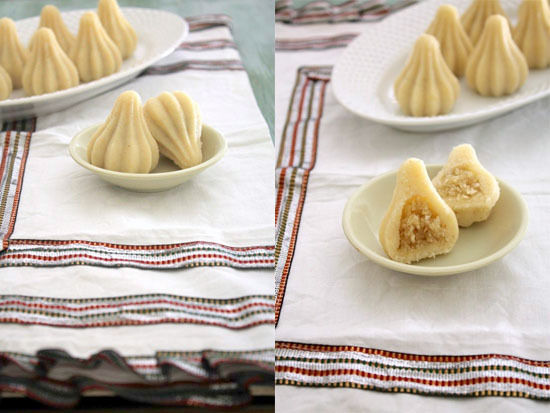 So I thought it is not yet late to share a modak recipe here. Happy Ganesh Chaturthi to my all readers. I have already shared the traditional modak recipe few days ago. That is made from rice flour. After it is shaped, you need to steam them. But For this rava modak recipe. 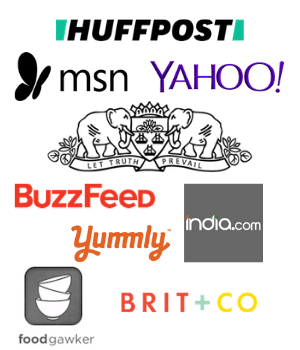 you don’t need to steam these modaks. Just make the dough and stuffing. Then shape using the mould. yes it is that easy to make. The stuffing is made from coconut and jaggery only. If you like you can add poppy seeds or chopped nuts and raisins. But here I have kept it plain. The outer cover is made from semolina and milk. The texture of it is so soft and fluffy. I have adapted the recipe from here. The original recipe was calling for coconut milk. But I have substituted with regular whole milk. Also the recipe says to shape them by hand. 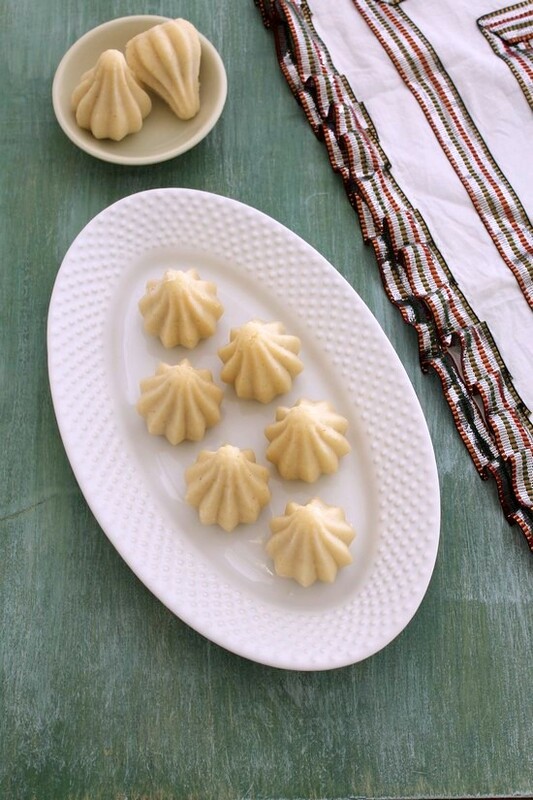 But here I have used modak mould just because it was easy and convenient to me. I have not tried without mould. The color of the stuffing depends on the type and color of the jaggery. Other modak recipes on the blog are Mawa modak // chocolate modak // fried modak. 1) First make the stuffing. Take coconut and jaggery in a pan. Turn the heat on medium. 2) Mix it well. Here I am using frozen shredded coconut, that’s why you see the big lumps here. 3) But as it heats up Jaggery will starts to melt and coconut will also starts to loosen up. 4) After couple of minutes, everything is well blended. Keep stirring and cooking. 6) cook till the mixture becomes dry. It took me altogether 6-7 minutes. Do not cook it for long time otherwise it becomes chewy. Turn off the stove and keep it side to cool. 7) While stuffing is cooling, make the dough for outer layer. take sooji in a pan on low-medium heat. 8) Dry roast it with stirring constantly. 9) Roast till it starts to change its color slightly. make sure that it does not get burn. It took me 7-8 minutes. 10) Remove it to a plate. 11) Now in a pan take water and milk. Turn the heat on medium. 12) Add ghee and mix. 13) Let the mixture come to a boil. 14) Once it starts boiling add roasted sooji. 15) Immediately start mixing it. It will thin and pasty. 16) Within a minute or two, it will starts to thicken up. 17) Keep stirring and cooking. 18) Till it comes together like a dough. It will take only 2-3 minutes. 19) Remove it to a plate. Let it cool down slightly. 20) As soon as you can handle the mixture, spread it on plate. So you can start kneading. 21) It should be hot or warm. Do not let it cool down for longer, otherwise you won’t get the smooth dough. 22) Keep kneading till you get smooth and non sticky dough. If you feel too hot, then you can dip your hand in the water and continue kneading process. 23) To shape the modak, Now grease the modak mould using ghee. Take small ball and insert into the mould. 24) Using your finger, press it tightly and make hollow center. 25) Fill the center using the stuffing mixture. 26) Now close the open part using little dough by pressing it. Make sure that it is sealed properly. 27) Carefully open the mould. 28) Remove the modak and place it on the plate. Continue shaping all the modaks. Serving suggestions: It is offered to Lord ganesha during the ganesh chaturthi festival as a bhog/prasad. Then it is served to everyone. Take coconut and jaggery in a pan. Turn the heat on medium. Mix it well. But as it heats up Jaggery will starts to melt. Add cardamom powder. cook till the mixture becomes dry. It took me altogether 6-7 minutes. Turn off the stove and keep it side to cool. Take sooji in a pan on low-medium heat. Dry roast it with stirring constantly till it starts to change its color slightly. make sure that it does not get burn. It took me 7-8 minutes. Now in a pan take water and milk. Turn the heat on medium. Add ghee and mix. Let the mixture come to a boil. Within a minute or two, it will starts to thicken up. Keep stirring and cooking till it comes together like a dough. It will take only 2-3 minutes. Keep kneading till you get smooth and non sticky dough. If you feel too hot, then you can dip your hand in the water and continue kneading process. 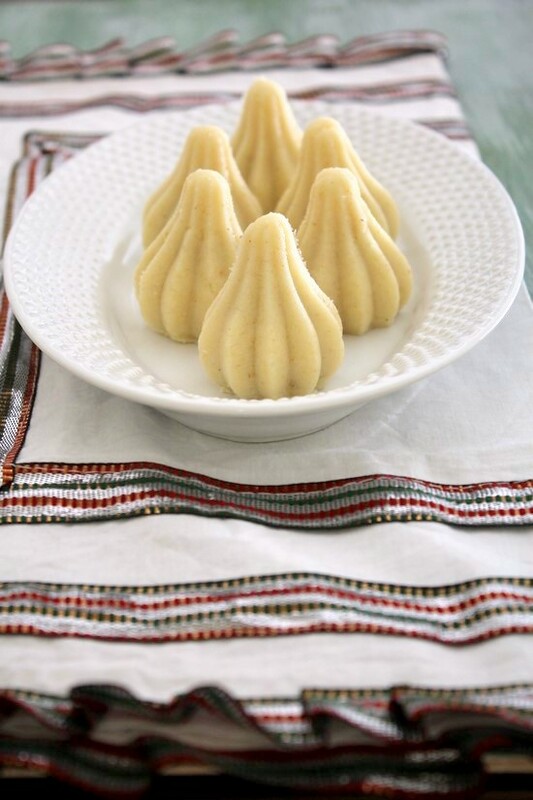 To shape the modak, grease the modak mould using ghee. Take small ball and insert into the mould. Using your finger, press it tightly and make hollow center. Fill the center using the stuffing mixture. Remove the modak and place it on the plate. Continue shaping all the modaks.